Transformation of pincer-type adducts to domino-type adducts with the raise of temperature. Credit: Fedor Zubkov (the illustration by Eugenia Lavrova). 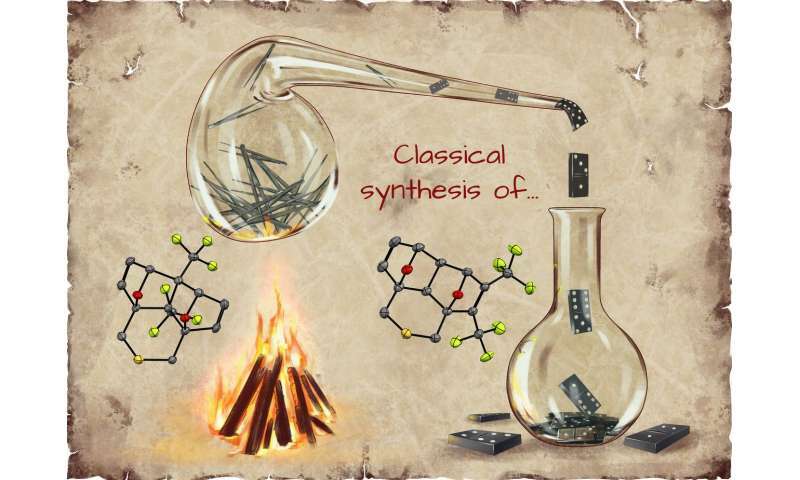 RUDN-based researchers, together with Russian colleagues, have studied the Diels-Alder reaction in the derivatives of furan (a heterocyclic organic substance) and managed to reach 100 percent control over the composition of its products. The described patterns may be useful for creating new methods of agricultural waste processing. Moreover, the reaction may be used for the manufacture of graphene fragments and a number of biologically active substances. The results of the study were published in the Journal of Organic Chemistry. The Diels-Alder reaction is widely used in organic synthesis. Chemists appreciate its simplicity, reliability, and the ability to influence its course and change the conditions of the process. Several products of these transformations are used to create graphene-like materials, product vitamins, hormones, and neuromediators. Due to its durability, as well as heat and electric conductivity, graphene is used in the development of transistors, sensors, filters and accumulators. RUDN-based scientists studied the variant of the Diels-Alder reaction in which two organic compounds (alkynes and bis-dienes) form a compound containing several six-membered cycles. The reaction proceeds differently at 25–80 °С and 140 °С: the structures formed in the first case (4а,8а-disubstituted 1,4:5,8-diepoxynaphtalenes) are called "pincer-type adducts," and in the second case (2,3-disubstituted 1,4:5,8-diepoxynaphtalenes), "domino-type adducts." In both cases, the formation of a single substance is observed (rather than a mixture, as in the majority of similar cases), and only one product can be isolated with almost quantitative yield. The initial compounds of the reaction were furfural and its derivatives. They can be obtained in almost unlimited quantities from agricultural waste including offals, sunflower seed husks and stems, sawdust, and chips of several types of wood. Availability and renewability of synthetic compounds based on these are especially important due to fluctuations on the oil market and depletion of their resources in the future. "The peculiarity of the transformation described in the work lies in the fact that they give us complete control over the composition of the products and allow us to individually obtain the necessary substances. This high level of control over the course of reaction is reached by changing only one parameter—its temperature. Almost no similar reactions have been known before our research," explained Fedor Zubkov, the head of the group, and assistant professor of the department of organic chemistry at RUDN. In the course of the experimental work, the scientists found optimal conditions for selective reaction control, namely, the temperature and the solvent (no catalyst is required). Depending on the nature of initial reagents, the process took from 20 hours to 10 days under room temperature to 140 °С. This helped change the ratio of two isomeric compounds (i.e. the compounds with similar chemical composition but different space structure) formed during the reaction. As a result, the researchers managed to determine reaction parameters leading to the formation of only pincer-type (25–80 °С) or domino-type (140 °С) adducts. "Besides the theoretical value, our work will be useful for processing human-generated waste and for identifying new, cheap renewable sources for fine organic synthesis. In the future we plan to synthesize libraries of substances for biological screening in order to identify biologically active substances," said Ksenia Borisova, a co-author of the work, and a postgraduate at RUDN.